To be a freelancer UX designer is appealing, but it’s not easy to become one. Here are 4 things you should know, and you can learn how to find UX works. Compared with the traditional full-time job, people under the Internet era nowadays are more preferred to pursue a kind of free life and working style. Free time, free place to work with high paid salary, these reasons attracted more people to become freelancers. Especially the designers in the IT industry, they want to be freelance UX designers. 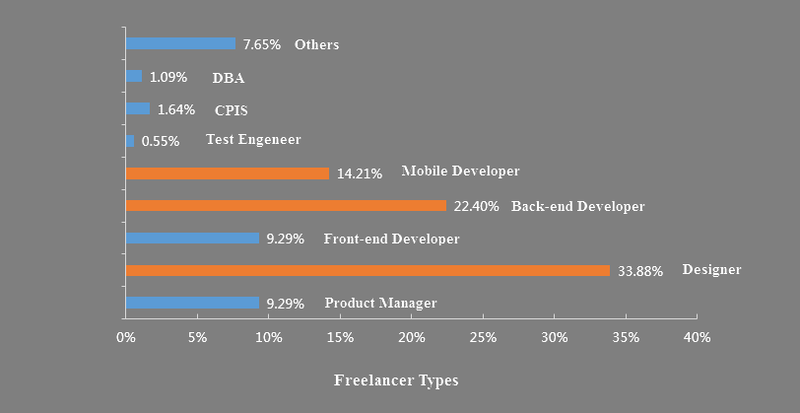 A freelance survey shows that the major IT-related career types of freelancers are designers, back-end engineers and mobile developers in the IT industry. Which accounts for about 70% of the freelancers. In the UI/UX designers group, women accounted for 46.81%, men accounted for 53.19%. Followed by product managers and front-end engineers, respectively accounted for 9%. 7.65% of the other groups are mainly the whole stack of engineers, sales and project management. In recent years, the success of the Internet and startups has been attributed to the needs of the product close to the user. The popularity of Internet of Things and wear technology is driving the development of the UX design industry, and the demand for UX designers is increasing. Market demand and the self-satisfied of designers stimulated lots of the full-time designers to shift to freelance UX designers. Because the benefits are so obvious. 1. Elastic working hours. That means the designers do not have to go to work in a regular nine or five. There will be more time for design or deep level of learning. 2. Free to choose the project, but not subject to company restrictions. Also, do not have to worry about the company leaders to be fastidious about your design. 3. Cooperation with multinational companies to gain higher income. But as a freelancer, in addition to seeing the "freedom", but you have to be clear about the drawbacks. Compared with full-time UX designers, freelance UX designers have to pay more attention to the stability of project resources. Once there is no project to do, it means that there is no income, no living security. According to the statistics, 84% of the more than 1 million freelancers in New York have no ability to afford the personal health insurance. To some extent, the freelance UX designer can be called as a full-stack designer. Creative thinking, research, and analysis, strategy formulation, prototyping, interactive design, etc. All that has to be done yourself. It will be an energy-cost job for you. By contrast, these series of things that should have a different functional division in a company to complete. I think you will be too tedious to give up. 4. How to become a good freelance UX designer? Freelance does not mean loose, even the independent UX designers, should have a good plan for their own career by enhancing their professional skill. Facing with inertia and loose, it is impossible for everyone to balance them very well. If you are really determined to lead your own work and life, then the salary of the full-time UX designers vs. free UX designers will be a decisive factor. Basic salary: $ 96K. A quarter of Base Salary for Freelance UX Designer are less than $82.5K. Half of Base Salary for Freelance UX Designer are less than $94.3K. The top quarter of Base Salary for Freelance UX Designer are more than $108K. The top tenth of Base Salary for Freelance UX Designer are more than $122K. Annual bonus: $ 13K. A quarter of Annual Bonus for Freelance UX Designer are less than $9.2K. Half of Annual Bonus for Freelance UX Designer are less than $12.3K. The top quarter of Annual Bonus for Freelance UX Designer are more than $16.4K. The top tenth of Annual Bonus for Freelance UX Designer are more than $21.2K. Annual Equity: $ 24K. A quarter of Annual Equity for Freelance UX Designer are less than $4.12K. Half of Annual Equity for Freelance UX Designer are less than $10.1K. The top quarter of Annual Equity for Freelance UX Designer are more than $24.7K. The top tenth of Annual Equity for Freelance UX Designer are more than $55.2K. One-time signing bonus: $ 17K. A quarter of Signing Bonus for Freelance UX Designer are less than $12.8K. Half of Signing Bonus for Freelance UX Designer are less than $15.8K. The top quarter of Signing Bonus for Freelance UX Designer are more than $19.6K. The top tenth of Signing Bonus for Freelance UX Designer are more than $23.7K. Obviously, what drives the UX designers to be freelance UX designers are not only the so-called“freedom”. As a freelance UX designer, how to get resources and contacts, how to find customers? Here are some of the resources I have sorted out. Toptal is a global elite freelancer platform, known as the first 3% of free professional software developers and designers. Toptal's freelancers are from 93 countries around the world, and their profession is mainly software developer and designer with thousands of people. As one of the most influential, most discussed online communities for designers. Many designers will go to Dribbble for inspiration and communication. While some companies or individuals will go for hiring freelance UX designers. Upwork is the world's largest and most comprehensive integrated outsourcing platform, currently has 12 million registered professional employees and 5 million corporate customers. Also, it is the world's largest outsourcing human services market, and freelancers are easily on the platform to receive such as IT programming, Translation, writing, design, purchasing, creative, legal, etc. Employers are also very convenient to find a variety of different types of service providers on the platform to join their own team or project. So how do freelance UX designers to be competitive in a growing situation of competition? The answer is to promote your strengths! Let yourself to be outstanding. The most important product is actually your own in your life. The best way to get a good job is to make friends with other freelancers. Do the best of your work and build good connection resources. One day you will benefit from it. As a secret freelance UX designer is not a good strategy. By blogging, showing yourself on a social platform, participating in various UX events, visiting forums, Quora, and so on are all great chances to show yourself and have communication with people. The full-stack designer does not mean that the whole product design and development process done by one. More is emphasized in the whole dimension of the project inside, you can know and control the more the better. Just as you are involved in products and projects, you understand the core purpose of the upstream product and logic, downstream, as well as the basic way to achieve. The importance of tools for freelance UX designers is self-evident. Master more design tools, will do more with less. The recent survey of design tools shows that Photoshop is slowly out of favor in the designer, freelance designers should follow the trend to learn new design tools and technology. From 4,000 respondents from nearly 200 countries, the designer's attitude to the new tool is open, and most importantly, the tool simplifies the time it takes to make wireframes, prototypes, and designs. Mockplus - Prototype design faster and simpler. To be a freelance UX designer is a cool thing, and I hope you make a decision is not a momentary impulse, but through a rational analysis. Making a clear analysis of the full-time UX designer vs. Freelance UX designers, knowing well about the pros and cons, and what will you get. Anyway, enjoy what you like, enjoy your life!